Mentors of Rotterdam is set to improve the educational outcome and future of children from areas with lower income/disadvantages through one-on-one mentoring, by matching every primary/high school student with a student mentor. The objective of Mentors of Rotterdam is to improve the educational outcome and future of children from areas with lower income/disadvantages through one-on-one mentoring, by matching every primary/high school student with a student mentor. The project started out with the matching and cooperation of 110 student mentors and 110 primary/high school students. In 2015-2106 around 700 student mentors and 600 primary/high school students were trained, matched and had a mentor/mentee relationship. The target for 2019-2020 is to train, match and work with 2000 student mentors as a mentor/mentee. Mentors or Rotterdam is part of a holistic approach within the Rotterdam Children’s Zone approach that is operational in Rotterdam South. This approach focuses on providing extra school hours and career orientation, parental involvement and extra care. The aim of the Rotterdam Children’s Zone is to contribute to an environment that ensures the best possible future for the children. In order to do so the Rotterdam Children’s Zone allocated resources to support and professional development of the teaching staff and provide the children with extra learning time and support. The idea was inspired by previous experiences gained during the student mentoring program Overtref Jezelf (Outdo Yourself) in Rotterdam South. This was a form of cross-age peer coaching. Schools in Rotterdam South were asking for more and more one-on-one coaching and mentoring from students of the Rotterdam University of Applied Sciences (RUAS). A team of the Center of Expertise and Social Innovation at RUAS developed the program for Mentors of Rotterdam, in close cooperation with the schools of Rotterdam South. After a succesfull pilot at higschool RVC De Hef, where student mentors played a crucial role in designing the outlook, methodology and training of the program, the methodology was designed and integrated in the curriculum of RUAS. To ensure funding for the program, Mentors of Rotterdam teamed up with Stichting de Verre Bergen, a philanthropic foundation in Rotterdam. To supervise the program, a special foundation was created: Student Mentors of Rotterdam. The board of this foundation consists of representatives on the executive level at RUAS, the center of expertise, the chairman of the educational board of Rotterdam South and of the philanthropic foundation. In regards to the methodology and theoretical frameworks, Mentors of Rotterdam is based on mentoring in general, cross age peer coaching and the research of Maurice Crul on superdiversity and Iliass el Hadioui on the relationship between street culture and school culture. desk research on proven success in practice of mentors. The theoretical framework of cross age peer coaching is based on the opportunity to build a one-on-one relationship with a mentor who isn’t above the mentee, but beside the mentee. The mentors are students who empower their mentees in their identity, who serve as role models for the mentees and who allow them to expand their frame of reference. The mentoring is based on the “how to serve, not to save” principle and assigns the student mentors three roles: talent development, coaching and tutoring. The main purpose of the mentors is to actively encourage their mentee to reach a higher level and provide them with the support to reach that level. The theoretical framework on superdiversity by Maurice Crul has helped Mentors of Rotterdam to understand the reality, challenges but also opportunities in a superdiverse city like Rotterdam. The theoretical framework on the relationship between street culture and school culture by Iliass el Hadioui has helped Mentors of Rotterdam to understand the identity development of the students in Rotterdam South, the need for identification with rolemodels and the importance of a sense of belonging. These insights have been translated to the specific context of Mentors of Rotterdam. The methodology is being revised on a frequent basis and connects insights from psychology, pedagogy, coaching, mentoring and sociology with the reality and context of students in Rotterdam South. 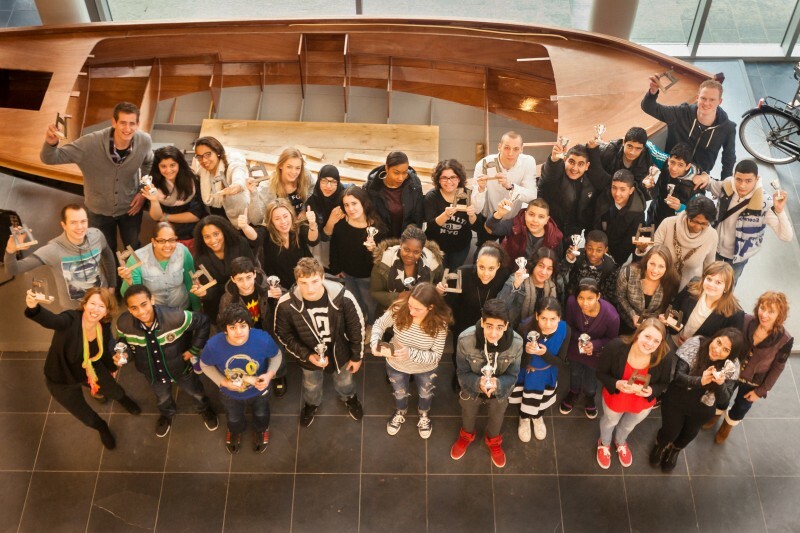 Mentors of Rotterdam focuses on two target groups: students of primary and secondary education (the mentees) in Rotterdam South and students of RUAS (the mentors). There are about 70.000 children living in Rotterdam South and about 32.000 students enrolled at RUAS. Over 70% of the people in Rotterdam South have a migrant background, 32% of them are under the age of 23. There are so many different cultures and communities to distinguish; it’s hard to set up specific policies for specific groups. In that sense Rotterdam South is truly superdiverse. There are however certain common challenges the people in Rotterdam South face and social characteristics to identify: many low income households, limited networks in relation to the labour market, poor housing facilities, many welfare dependent families, having to deal with language deficiencies, high drop out rates and a relative low percentage of students who enter higher education in relation to the rest of Rotterdam or The Netherlands. Research and experience has shown that children of schools in Rotterdam South are inclined to view their student mentors as rolemodels. They are more willing to accept guidance, compliments and coaching and have a more open and beneficial relationship with their student mentor. Mentors of Rotterdam provide these children with a supportive network, personal attention and vision for the future. The program is implemented by a program team and cooperates with approximately 7 highschools, 7 primary schools, 18 professors of RUAS and 6 academies of RUAS. Mentors of Rotterdam is funded by a private philanthropic foundation and isn’t dependent on political support. However the political climate does affect the public debate on the multicultural society in The Netherlands and has a negative influence on the attitude towards migrant communities. Mentors of Rotterdam have the support of the management of schools, of RUAS and of the Alderman of youth and education from the City of Rotterdam. It is one of the vital programs of the National program for Rotterdam South, which is a cooperation between all government levels, housing boards, and local communities of South. Stakeholders supporting the initiative are the foundation De Verre Bergen, RUAS, faculty departments, teaching staff and school board of Rotterdam South. Other stakeholders are the mentees, the student mentors and the parents of the mentees, but also corporations, like Rabobank, that support the program by providing guest lectures for example. Demographic changes that influence the program are the large percentage of youth living in South, the lower economical status, the growth of a mix and variation of children with various ethnical backgrounds (superdiversity) and more recently the growth of the number of children with a refugee background. The goals of Mentors of Rotterdam are aligned with the overall approach of the Rotterdam Children’s Zone, which aims to improve the future of children growing up in this area. In addition the program also aligns with the institutional strategy and culture of RUAS in terms of its public responsibility to reach out to schools. This strategy is based on the idea that professionals of RUAS need to be prepared and equipped for a diverse environment and the fact that many of the children are prospective students. Critical factors for success have been the ability to pioneer at RVC de Hef, which won the National Education Award in 2015 for this program, the relationship with long term investment partner the Verre Bergen fund and the tenacity of the program team. The essential critical factor is the magic mix that fortunately occurs most times between the student mentor and the mentee when a human connection is established. A central program team selects participating schools. With the management team of these schools, classes of eligible mentees are selected. With the class mentor, the goal for this class is discussed. Together with the management team of the several institutions of the RUAS , the program team looks for the best fit in the curriculum of the students for the program mentors of Rotterdam. These first two steps are necessary for the recruitment of mentees and studentmentors. The program team makes a goal-match; we match the student mentors according to their ability and interests to the group of mentees with a matching need for mentoring. This requires that both the student mentors and the mentees at the school have a matching schedule, to enable the mentoring to take place. After this goal-match phase, the training and screening of the student mentors begins. A minimum of two training sessions takes place. The mentees also receive a preparatory class to prepare them for their time with a student mentor. After the training, the individual matching takes place: every mentee is matched with a student mentor. Matching is based on shared interests and shared school experience, as these prove to be the most important factors for a positive relation. The first meeting between the student mentors and mentees takes place in the school of the mentee. The student mentors provide school-based mentoring, which means that all student mentors work in the school during school hours. This guarantees immediate contact with the teaching staff, and is a safe and familiar setting for the mentees. 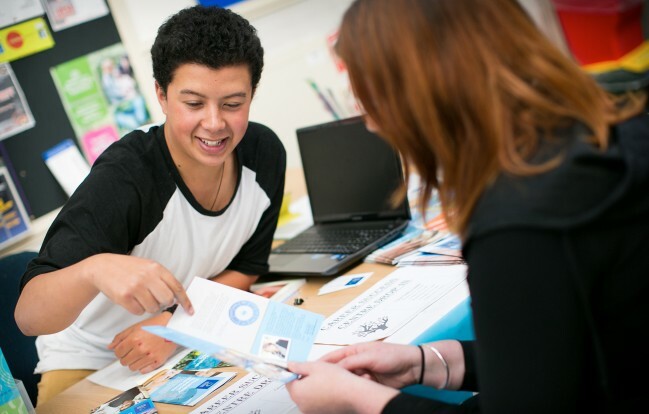 The student mentors give approximately 20 hours of one-on-one mentoring. They focus their mentoring on three roles: tutor (academic results), coach (self efficacy and self confidence) and talent development and career counselling. Each mentor session requires preparation. This preparation is obligatory, and part of the student assesment. To enrich the mentorsession, a toolkit is provided, both real-time and virtual. The professor of RUAS is on-site, and provides coaching and counselling when needed. The presence of the professor is a prerequisite to make sure the mentoring process runs smoothly. After the mentor session, all student mentors receive intervision and reflect on their effectivity as a mentor. This intervision session is supervised by a professor of RUAS. The school of the mentees contributes to these sessions. The interactions between teaching staff of the school of the mentee, the professor of RUAS and the student mentors ensure that a learning network is created which has only one goal: to improve the future of the mentees. The student mentors are required to reflect after each mentor session on effectivity and their own coaching skills. At the end of their course as a student mentor, they hand in a report on their mentee and reflect on their professional development. This report is reviewed and graded by the professor of RUAS. The mentor course ends with a festive session, where student mentors and mentees end their partnership. Both receive certificates of attendance. Key roles of the program are fulfilled by the program team (program manager, head of methodology, business process manager and assistant), professors of RUAS (trained professionals, with indepth knowledge of coaching, skills for relationship management and experience in dealing with youngsters), school staff (management and teaching staff of mentees’ school), trainees (former student mentors, assistants to the professors of RUAS) and the executive board (board of directors, board of the foundation of mentors of Rotterdam). The program receives funding until 2019-2020 from the foundation De Verre Bergen. Some expenses are investments, such as the investment in an application to manage the mentoring process, and the costs of training teachers and designing the methodology. As part of the funding is done through the RUAS, and the program is implemented in the courses of RUAS, the expenses are expected to diminish. However, still a substantial amount of funding needs to be ensured. To be prepared for this next phase, an exit strategy is being designed to ensure future additional funding and support to continue the program. In terms of replication Mentors of Rotterdam is now linked to the Thomas More university of applied sciences in Rotterdam to replicate the program. Mentors of Rotterdam is joint venture by the Center of expertise for social innovation (EMI) at Rotterdam University of Applied Science and the foundation De Verre Bergen. The foundation provides a part of the funding. Other resources are provided by RUAS and the participating schools in terms of the program team, necessary facilities and time. There are no volunteers involved in this program. The budget is confidential. Mentors of Rotterdam is a data driven intervention and is monitored rigorously. Evaluation and improvement of the methodology and of the programs execution are deeply embedded in the structure of the program. on the level of faculty teachers the evaluation focuses on continuous improvement. Participants are asked to fill in an evaluation form after each mentor/mentee connection. The program is monitored by an independent research company, Panteia. This independent monitoring is supervised by a committee of relevant professors of various disciplines. Panteia monitors the effects and outcomes of the intervention, and also studies the longitudinal effects. The first monitor was based on the process of the program and was positive. The first effect monitoring is due to arrive at summer 2016. Unintended outcomes of the program are that it creates more qualified and motivated teachers in schools in Rotterdam South, improved preparation for the labour market and traineeships and increasing the social responsibility of RUAS students.